One of the most stunning views in all of Alaska is the sunrise over Denali, the Alaska Range, and Wonder Lake in Denali National Park. Spending a sunny morning walking around the northern end of the lake is the closest thing to heaven I know. 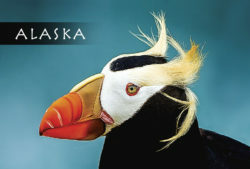 I am happy the Alaska Conservation Foundation was able to use this image in their latest fundraising efforts. 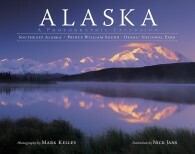 Conservation of Alaska’s natural environment helps sustain my work as a nature photographer. I am so proud and honored to announce that National Wildlife® Magazine selected this image of my wife cross-country skiing through the snowy field in Spaulding Meadows for first place in the “People In Nature” category in their 2018 photo contest. Over 23,000 images were entered in eight different categories. 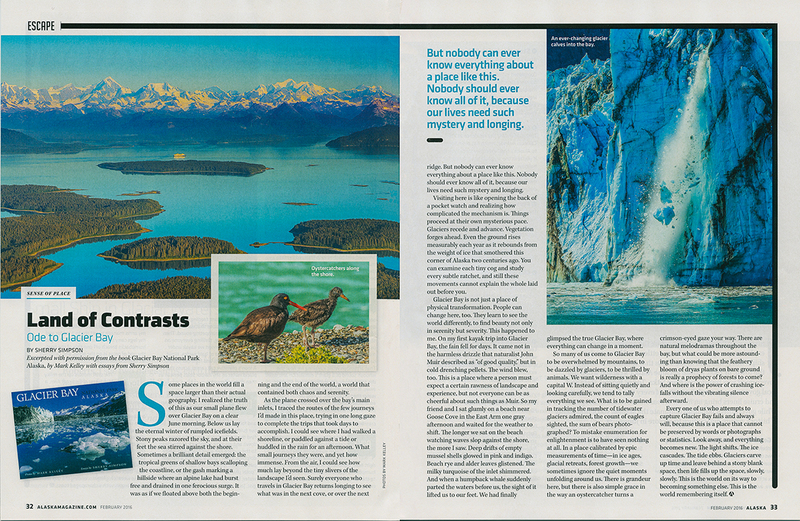 The image was featured in National Wildlife® magazine’s December-January 2018 issue. 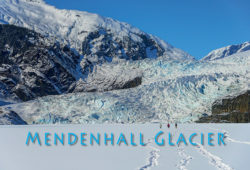 I am proud to announce that my latest book “Alaska’s Mendenhall Glacier” is a gold winner in the prestigious IBPA Benjamin Franklin award program. 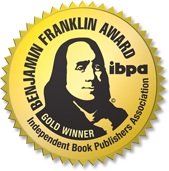 The IBPA Benjamin Franklin Awards™ are regarded as one of the highest national honors for independent book publishers. Winners showcase a publisher’s commitment to high-quality book content and production. From close to 1,500 entries, one gold winner was named in each of fifty-four categories. Meanwhile, the book has also been selected as a finalist in two categories of the Foreword INDIES Book of the Year Awards, and the winners will be announced June 15, 2018. This is an exciting time! 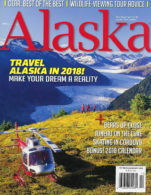 I was scanning the magazine covers in the checkout line at our local grocery store, and did a double take when I spied Alaska Magazine. The front cover image looked like one of my photos, and sure enough the credits showed that my photo agent had sold one of my photos to the magazine. I took this image while on a photo shoot with TEMSCO helicopters in Juneau about 10 years ago and submitted it to a photo agent. How cool to see it show up ten years later as a magazine cover. It is an honor to be featured in the “Winner’s Profile” on NANPA’s website. I am still blown away to be a 9-time winner in their 2017 Showcase competition. NANPA is North America’s premiere nature photography organization. It has been a year in the making, and I am very happy with the results. 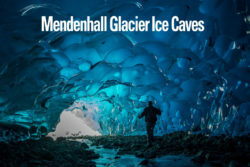 “Alaska’s Mendenhall Glacier” features my favorite glacier! 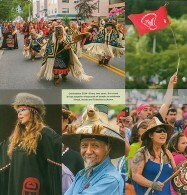 Class Magazine in Italy used these Mark Kelley images for this beautiful layout in their Alaska story. WOW! Every other year I participate in the NANPA Showcase Photo Competition. NANPA, the North American Nature Photography Association, is North America’s preeminent nature photography organization. For the 2017 Showcase Competition 369 Photographers submitted a total of 3350 images. Three Mark Kelley images made it in the top 20! I am happy the image “Bald Eagle Fire”, shot in Adak, Alaska, made Best in Show. The image is a great example of why I like to sometimes call myself a nature photojournalist. It is an honor to have been selected for a Mayor’s Award for the Arts this year. Read more at the Juneau Empire. The celebration for the awards is Aug. 19, 5:30–7:30 p.m. at the Juneau Arts and Culture Center. There will be live music, election of new JAHC board members, and award presentation, among other things. The event is free; anyone can attend. A fun shot of a sea otter in Frederick Sound, taken during a recent photo expedition with great new friends. A big thank you goes out to captain Ronn Patterson of the Delphinus and Dolphin Charters. The Memorial Maria Luisa Photo Contest is an International Mountain, Nature, and Adventure Photo Contest. Winners in the 26 MML were selected from 16,000 entries by 1772 photographers from 79 countries. Just six Americans made the winners’ list and I am honored to be the only American with four Honorable Mentions. 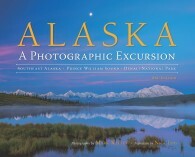 My entry Denali Dream received an honorable mention and is also the book cover of the newly released second edition of the Alaskan bestseller Alaska: A Photographic Excursion. 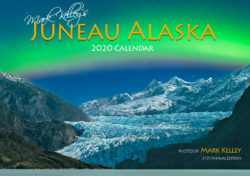 The entry Glacier Calve OMG is the cover of my 2017 Alaska Calendar. Some beautiful winning images and all four Mark Kelley entries can be viewed in this twenty minute 26 MML-Photo Video (at 1:02, 3:18, 4:00, and 6:45) ,and during the 26 MML travelling exhibit in Spain. Thank you for visiting markkelley.com! Thanks for all who came to my show at the Mendenhall Glacier Visitor Center. This year’s Fireside Chat titled “Thinking Photos” focused a bit more on the technical aspects of photography. 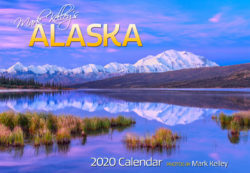 I especially wanted to share my insights with members of the Juneau Photo Group, who post such amazing photos on Facebook for all of us to enjoy. My way of saying thank you, and for keeping up the great work! I have been photographing Glacier Bay for over 35 years, and this last summer was the first time I was able to get really close to Johns Hopkins Glacier. As soon as we got there on July 5, Johns Hopkins started going off like the 4th of July fireworks. In the space of two hours we had at least seven major calvings. This image is the first calving and I just pulled up and shot. I was shooting my Nikon 80-400mm in DX mode which gave me the equivalent of a 600mm lens. Everything happened so quickly, I did not even see the kayakers in the frame. 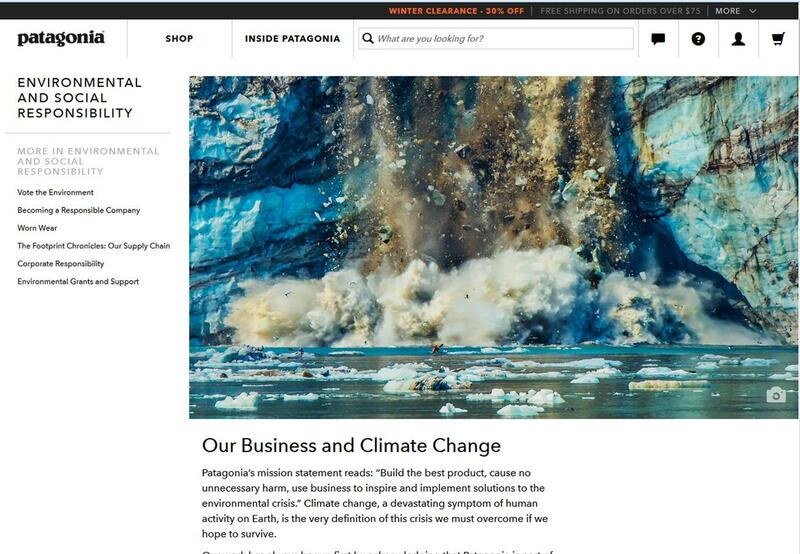 What a PATAGONIA moment! I received a really fun gift today: I got Binged! Microsoft’s search engine, Bing, used this image I shot of Amalga Harbor as their homepage image of the day today. How fun is that! Bing is the second largest search engine in the US with more than twenty percent share of the market. A big thank you to Bing and to the Kegler family here in Juneau. The Kegler’s purchased the Christmas tree on their floating dock from state surplus and used a forty foot under water electrical cable to light it up. A true Alaskan moment. 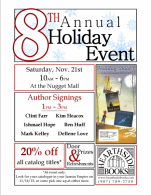 I will be signing calendars at Hearthside’s Annual Holiday Event this Saturday, November 21, from 1-3. See you at the Nugget Mall! This past month I spent seven days onboard Ronn Patterson’s M/V Delphinus as photo leader for Dolphin Charters. Eight photographers joined us for a full week in Glacier Bay National Park, what an amazing trip. Glacier Bay just keeps calling me and I will keep going back. The weather has been great in Juneau this last week, and is forecasted to continue into next week. Tracy Arm is one of my very favorite places to go on a sunny day. 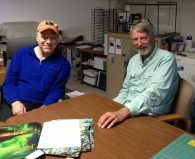 I joined Adventure Bound Alaska and captain Steve Weber for a great day on the water in Tracy Arm. Wildlife was out in force and we saw killer whales, harbor seal, sea lions, bears, and many eagles. I enjoyed working with the folks from Princess Cruises on this shoot. 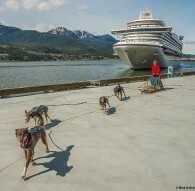 Can’t beat hanging out with sled dogs and mushers on a sunny day on the Juneau docks. Happy Summer! Proud to partner up with UNESCO and Jaeger-LeCoultre and to make a cameo appearance in their video. Did I just start a career in front of the camera? 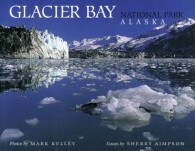 Glacier Bay National Park is the star in New York this Earth Day and in Forbes Magazine! I have spent more than eight months of time in Glacier Bay over the years and it holds a special place in my heart. It is a wild land of silence and glacial thunder. Celebrate Glacier Bay today…Thank you UNESCO and Jaeger-LeCoultre. 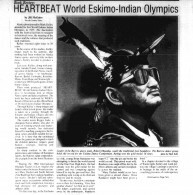 Celebration is one of the largest gatherings of Southeast Alaska Native peoples and it is the second largest event sponsored by Alaska Natives in the State of Alaska. Celebration is held every other year, and I was the official photographer for Celebration 2014. It is a true honor to attend the event and bear witness to the importance of this cultural celebration to the people of Alaska. 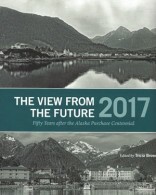 Sealaska released its annual report and included a beautiful collage of images. GRAPHIS announced its winners of the 2015 Photography Annual this week. 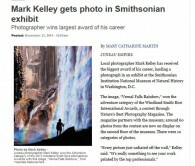 Two Mark Kelley images claimed a Silver prize and a third image qualified for a Merit award. I took the image below while on vacation in Portugal in 2013. “Portugal Sunset” is a silver award winner. The Photography competition features some of the most compelling photography of the year. I am looking forward to the actual magazine which will include the silver prize winners. I thought I would share my Smithsonian acceptance speech for my family and friends who missed the great event. 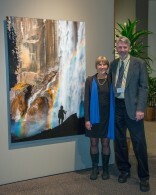 This image of the exhibit was taken at the end of the awards gala as we were leaving the exhibit. How cool is this. I am in the Smithsonian in DC, and even better, my image is in the Smithsonian. Thank you Nature’s Best for this great honor and for this grand evening of celebration. Thank you to my family and friends for showing up and sharing this moment with me. Most of all, thank you to my wife, Jan, who when our boys were very tiny and the money was very tight, convinced me to give up my weekly paycheck as the photographer for the local daily newspaper in order to pursue my dream of becoming a nature/wildlife photographer. Fast forward 21 years later, and I am standing here receiving this award; a sweet acknowledgement of our very good decision. Finally, this photo REALLY would not have been possible without Jan…she is the human standing in this piece of heaven on earth in Yosemite National Park. Thank you MARY CATHARINE MARTIN for your article in the Juneau Empire. The Empire included a large sized image of the photo in the Smithsonian exhibit – it covered almost half the page! 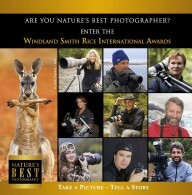 Enjoy this video of the 2013 Windland Smith Rice International Awards Exhibition at the Smithsonian Museum of Natural History. On location as a guest speaker at Camp Denali during the Special Emphasis Series 2014: “Autumn Nature Photography Workshop”. Anan Wildlife Observatory at Anan Creek near Wrangell, Alaska is one of the few places in Alaska where black bears and brown bears congregate in the same place. 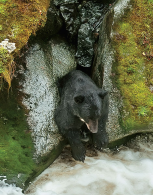 I love coming here because there are SO many bears; some forty to sixty black bears and about five to ten brown bears visit the Anan Creek drainage during the summer to fish. Just to feel the action at Anan I shot this short clip on Youtube with my Nikon D800. Mark Kelley’s “Once Upon Alaska” has been honored by Mom’s Choice and is now A Mom’s Choice Awards Gold Recipient. Time to update the Facebook banner. So many images to choose from! 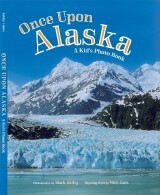 “Once Upon Alaska” was featured during KTOO’s Morning Edition. Thank you Lisa Phu and Matt Miller. Mark at work photographing bears around Pack Creek on Admiralty Island, Alaska. He took a small side trip to this unusual Sitka Spruce Tree. Looking forward to this lecture with Lynn Schooler. Join us on the 25th at UAS! Thank you Abby Lowell at the Juneau Empire for featuring Mark Kelley in your article.